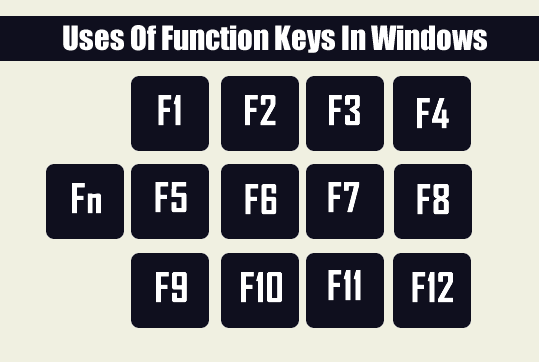 Commonly known as function keys on a computer keyboard, F1 through F12 may have a variety of different uses or no use at all. The operating system installed on the computer and the software program that is currently open dictates how each of these keys operate. A program is capable of not only using each of the function keys, but also combining the function keys with the Alt or Ctrl key. For example, Microsoft Windows users can press Alt + F4 to close the currently active program. Almost always used as the help key, almost every program opens a help screen when this key is pressed. Windows Key + F1 would open the Microsoft Windows help and support center. In Windows renames a highlighted icon, file, or folder in all versions of Windows. Alt + Ctrl + F2 opens document window in Microsoft Word. Ctrl + F2 displays the print preview window in Microsoft Word. Quickly rename a selected file or folder. Often opens a search feature for many programs including Microsoft Windows when at the Windows Desktop. In MS-DOS or Windows command line F3 will repeat the last command. Shift + F3 will change the text in Microsoft Word from upper to lower case or a capital letter at the beginning of every word. Windows Key + F3 opens the Advanced find window in Microsoft Outlook. Open Mission Control on an Apple computer running Mac OS X. Open find window in Windows 95 to XP. Open the address bar in Windows Explorer and Internet Explorer. Repeat the last action performed (Word 2000+). Alt + F4 closes the program window currently active in Microsoft Windows. Ctrl + F4 closes the open window within the current active window in Microsoft Windows. In all modern Internet browsers, pressing F5 will refresh or reload the page or document window. Refresh the list of contents in a folder. Open the find, replace, and go to window in Microsoft Word. Starts a slideshow in PowerPoint. Move the cursor to the address bar in Internet Explorer, Mozilla Firefox, and most other Internet browsers. Ctrl + Shift + F6 opens to another open Microsoft Word document. Reduce laptop speaker volume (on some laptops). Commonly used to spell check and grammar check a document in Microsoft programs such as Microsoft Word, Outlook, etc. Shift + F7 runs a Thesaurus check on the word highlighted. Turns on Caret browsing in Mozilla Firefox. Increase laptop speaker volume (on some laptops). Function key used to enter the Windows startup menu, commonly used to access Windows Safe Mode. Used by some computers to access the Windows recovery system, but may require a Windows installation CD. Displays a thumbnail image for all workspaces in Mac OS. Refresh document in Microsoft Word. Send and receive e-mail in Microsoft Outlook. Opens the Measurements toolbar in Quark 5.0. Reduce laptop screen brightness (on some laptops). With Mac OS 10.3 or later, displays a thumbnail for each window in a single workspace. Using the Fn key and F9 at the same time opens Mission Control on an Apple computer running Mac OS X. In Microsoft Windows activates the menu bar of an open application. Shift + F10 is the same as right-clicking on a highlighted icon, file, or Internet link. Access the hidden recovery partition on Compaq, HP, and Sony computers. Enter CMOS Setup on some computers. With Mac OS 10.3 or later, shows all open Windows for the active program. Enter and exit fullscreen mode in all modern Internet browsers. Ctrl + F11 as computer is starting to access the hidden recovery partition on many Dell computers. Access the hidden recovery partition on eMachines, Gateway, and Lenovo computers. With Mac OS 10.4 or later, hides all open windows and shows the Desktop. Open the Save as window in Microsoft Word. Ctrl + F12 opens a document In Word. Shift + F12 saves the Microsoft Word document (like Ctrl + S). Ctrl + Shift + F12 prints a document in Microsoft Word. Preview a page in Microsoft Expression Web. Open Firebug or browser debug tool. With an Apple running Mac OS 10.4 or later, F12 shows or hides the Dashboard. Access the list of bootable devices on a computer at startup, allowing you to select a different device to boot from (hard drive, CD or DVD drive, floppy drive, USB drive, and network). On newer Apple keyboards the F13, F14, and F15 may be shown in place of the Print Screen key, Scroll lock key, and Pause key. On newer Apple keyboards the F16, F17, F18, and F19 keys are above the number pad. Early IBM computers also had keyboards with F13 through F24 keys. However, because these keyboards are no longer used, they are not listed on this page.